To us bipedal bags of meat, most plants seem like relatively passive organisms, miserably rooted in place and forced to endure whatever climatic conditions are thrown at them. But upon closer inspection, we will find that plants are actually quite amazing, often exhibiting mind-blowing abilities like photosynthesis, bioluminescence and even predatory behaviors that are the result of millions of years of evolution. So yes, plants are pretty neat — but by and large are still stationary lifeforms. But what would happen if plants were merged with machines? 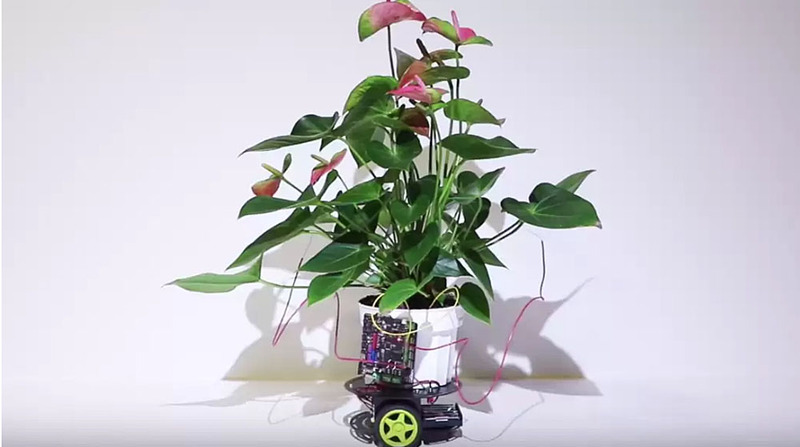 Nicknamed Elowan, this cybernetic plant is interfaced with a set of robotic wheels through a series of silver electrodes that detect bio-electrochemical signals from the plant, which are a natural response to changes such as light, gravity, stimulation, temperature, damage, and other factors. 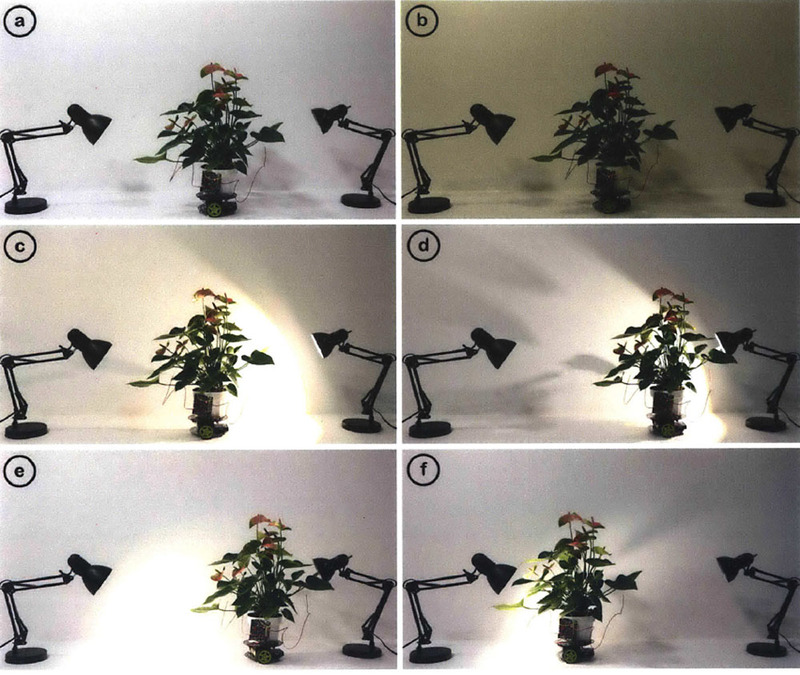 While plants will naturally and ever-so-slowly grow themselves in a way that maximizes their exposure to life-giving light, in this case, Elowan is capable of acting upon its own bio-electrochemical impulses — its “plant brain,” if you will — by autonomously wheeling itself toward the light. 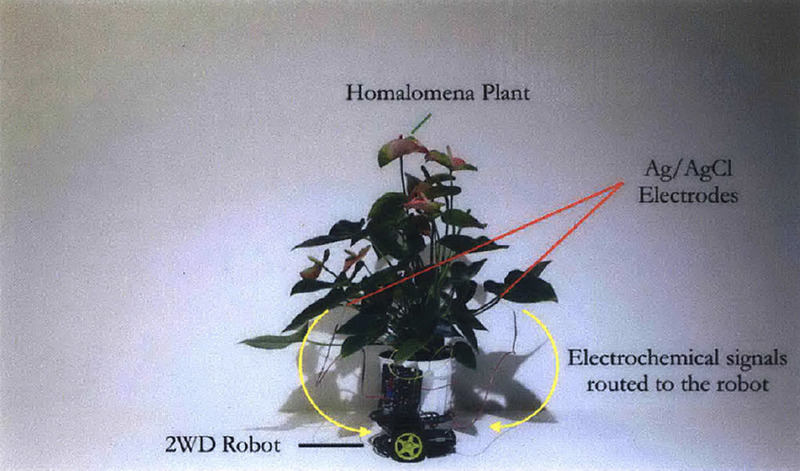 To achieve this, Elowan’s natural electrical signals are amplified In the team’s experiments, the cybernetic plant was placed in between two sources of light, alternating between on and off. As one light is turned off and the other turned on, Elowan’s pores (stomata) open and its cells depolarize. The electrodes sense these changes in the signals, which are amplified with an instrumentation amplifier and routed into the robot microcontroller, which has been programmed to react by turning the wheels in the correct direction, rotating its 2WD Drive Robot base away from the extinguished light, then moving toward the illuminated source. An emerald gem (Homalomena) plant was chosen due to its large, waxy leaves and its strong output of electrical signals. The idea here was to build upon plants’ natural characteristics, to imagine a more sustainable world where bio-hybrids might be the norm, and where plants and machines can exist symbiotically. But the idea of “cyborg botany” doesn’t stop at autonomous bio-hybrids that can move around of their own will. Sareen also envisions that such augmented plants could someday form the basis for a kind of “automated arbortecture,” where plants are used to create a new kind of self-growing, self-repairing architecture. 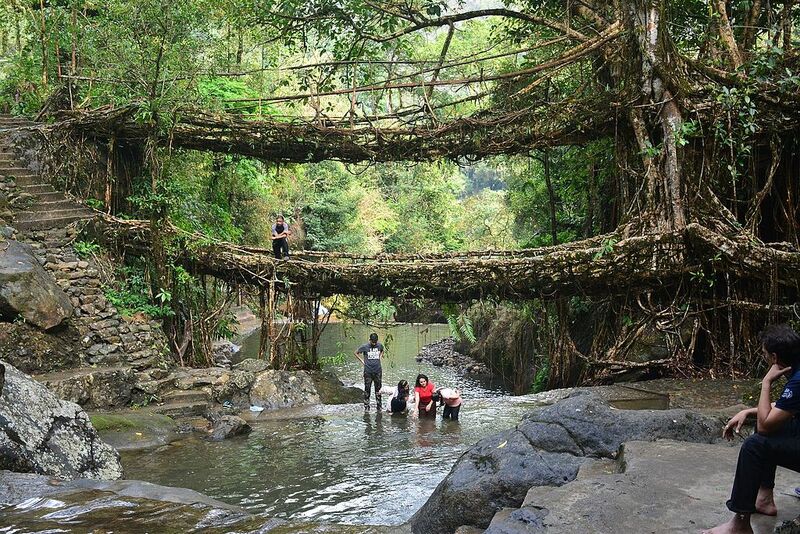 Like the ancient root bridges seen in India, plant-based buildings and infrastructure could grow and transform themselves as needed, leading to more self-sufficient and resilient cities, resulting in an “alternative ecology” that merges the best of both plant and machine. We might also have “cyborg gardens” where edible plants would be capable of cultivating themselves, so that we might harvest them as food later. To find out more, read the paper, and visit the project page.